Lesley J. Gordon holds the Charles G. Summersell Chair of Southern History at the University of Alabama. 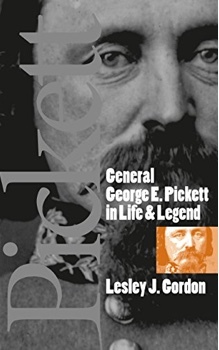 A former editor of Civil War History, she is the author of General George E. Pickett in Life and Legend (1998) and A Broken Regiment: The 16th Connecticut’s Civil War (2014) and a coeditor of Inside the Confederate Nation: Essays in Honor of Emory M. Thomas (2005) and This Terrible War: The Civil War and its Aftermath (3rd edition, 2014). She is currently at work on a book manuscript entitled "Battlefield Cowardice: Violence and Memory in the American Civil War." Find her on Twitter:@ljgordon106. There are a few books that I’m reading now; some related to my current book manuscript, others related to my teaching. I just finished Luis Emillio’s A Brave Black Regiment, which I’d assigned to my undergraduate Civil War class. And I’m currently rereading John Keegan’s The Face of Battle. That is difficult to answer given how many history books I’ve read through the years. I’d say one of my favorites is the one I’m presently rereading: John Keegan’s The Face of Battle. Each time I return to it, and I’ve lost count how many times, I am struck by how insightful it is to the kinds of things I’ve sought to explore in my own work. I became fascinated by Civil War history as a high school student, which only grew once I was an undergraduate in college. One of my college professors took me aside one day and essentially asked if I’d like to do what she was doing and pursue a doctorate degree in history. I had no idea what exactly that meant as far as graduate school or what kind of job prospects there were. But as soon as she suggested it to me, I never looked back. I feel grateful that I’ve been able to teach, write and think about history for a living. I honestly can’t imagine doing anything else. The historians I admire the most are knowledgeable, but continually seek to learn more. They question accepted assumptions about the past, and they are creative and imaginative in their methods and approaches, but also care about good writing and effective teaching. I think all of these are necessary qualities for the craft of history. Which historical time period do you find to be the most fascinating? I’m most drawn to the American Civil War era—it’s been that way since I was a teenager. I try to read widely and be informed about other fields, but I return to this time period as the most compelling to study and write about. I’ve had many teachers through the years who became role models to me. But I’d say my favorite would have to be my high school history teacher, Pat Metzner, who first introduced Civil War History to me. Looking back, I don’t think it was a coincidence that she was a woman teaching this subject. Based on her example, I assumed I could do it too, and focus on the military, which has always been my main interest. What are your hopes for world and social history as a discipline? Generally, I hope that world and social history, as much as United States History, are valued and supported at every level: secondary through college. We need good history and good history teachers. I do—most of them given to me as gifts. I have a bayonet and minié balls found on battlefields. And I have first edition copies of U.S. Grant and Philip Sheridan’s memoirs. I’ve been fortunate in my career, starting out at a small regional school in Kentucky and currently holding an endowed chair at a large flagship state university. Through the years, and my varying institutions, I’ve always found teaching undergraduates to be very fulfilling and rewarding. My advisor Emory Thomas once said that if you could explain complex historical ideas to a roomful of undergraduates, you were doing something right. I’ve also found it rewarding creating collaborations with fellow historians, many of whom have become good friends and mentors. The most frustrating part is what’s been happening to our discipline for a while now: the erosion of the humanities and the difficult job market for young scholars. The two are of course interrelated. When I began as a young historian more than twenty years ago, the Internet was just beginning to change the field and our profession. I’ll admit that I was a skeptic about how much lasting impact all of this would have on how we conduct our research, teach our classes and disseminate ideas. Of course, it’s had a tremendous, and generally positive effect. We can do our research in new and exciting (and often more efficient) ways. More primary resources are available to both students and scholars. And we can communicate with a larger audience, notably through the advent of social media. Nonetheless, some things stay constant: the importance of visiting archives (not everything is online), questioning your sources, reading widely and writing well. I once had a colleague who was discussing Reconstruction with his students and said essentially: “history should not make you feel good.” That resonated with me—the stories and questions that most interest me are frankly, not really reassuring or affirming. I’m most intrigued by the anti-hero narrative or those who faltered and failed more than those who succeeded. Currently, I’m at work on a book manuscript about cowardice and the Civil War. I’m examining select regiments accused of faltering in battle and how those accusations affected them in the short and long term.